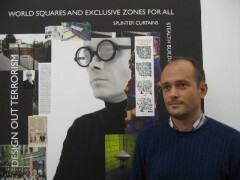 Nils Norman is an artist working across the disciplines of public art, architecture and urban planning. His projects challenge notions of the function of public art and the efficacy of mainstream urban planning and large-scale regeneration. Informed by local politics and ideas on alternative economic, ecological systems and play, Norman’s work merges utopian alternatives with current urban design to create a humorous critique of the discrete histories and functions of public art and urban planning. He exhibits and generates projects and collaborations in museums and galleries internationally. He has completed major public art projects, including a pedestrian bridge, small playgrounds and a landscaping project for the City of Roskilde, Denmark. He has participated in various biennials worldwide and has developed commissions for SculptureCenter, Long Island City; London Underground; Tate Modern; Loughborough University; Creative Time, NYC and the Centre d’ Art Contemporain, Geneva, Switzerland. At the moment he is developing two small-scale urban farming parks in The Hague, the Netherlands, that test and question the limitations and potentialities of permaculture as a possible city-wide alternative design strategy for urban centres. He is also the lead artist for the city of Cambridge’s project to redevelop part of Trumpington, an area on the city’s southern fringe – developing play elements, street furniture, an allotment and community garden and way finding. He is the author of four publications: Edible Park, Nils Norman. Eds. Taco de Neef, Nils Norman, Peter de Rooden, Astrid Vorstermans. Valiz, NL. 2012; Thurrock 2015, a comic commissioned by the General Public Agency, London, UK, 2004; An Architecture of Play: A Survey of London’s Adventure Playgrounds, Four Corners, London, UK, 2004; and The Contemporary Picturesque, Book Works, London, UK, 2000. Nils Norman lives in London and is a Professor at the Royal Danish Academy of Art and Design, Copenhagen, Denmark, where he leads the School of Walls and Space.